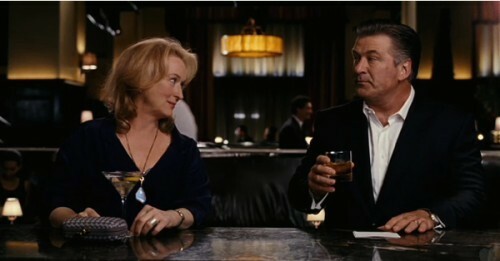 Nancy Meyers directs the always brilliant Meryl Streep in this comedy romance about letting go and moving on. Streep plays Jane, a divorced baker with three older kids and who is working to renovate her home. At her son's graduation, Jane runs into her exhusband Jake (Alec Baldwin) who despite being remarried with a young son, still feels something for Jane. Predictably they land in bed together and when the kids discover the misadventure all sort of woe-is-me moments ensure. This story has been done many times previously and in an attempt to mix it up a little Steve Martin arrives as Adam, the architect Jane has hired to renovate the house, whom she also starts misadventuring with. The film is fun and silly and has some genuinely hilarious bits. While Streep and Baldwin are great and do carry the film, It's Complicated is anything but.